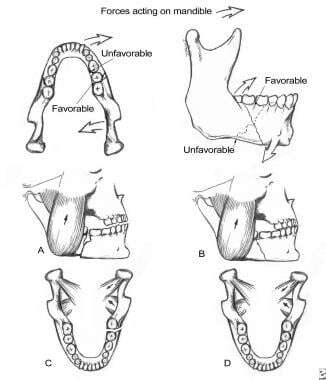 Fractures of the mandibular body may be classified by anatomic location, condition, and position of teeth relative to the fracture, favorableness, or type. Angle fractures occur in a triangular region between the anterior border of the masseter and the posterosuperior insertion of the masseter. These fractures are distal to the third molar. Mandible fractures are also described by the relationship between the direction of the fracture line and the effect of muscle distraction on fracture fragments. Mandible fractures are favorable when muscles tend to draw bony fragments together and unfavorable when bony fragments are displaced by muscle forces. Vertically unfavorable fractures allow distraction of fracture segments in a horizontal direction. These fractures tend to occur in the body or symphysis-parasymphysis area. Horizontally unfavorable fractures allow displacement of segments in the vertical plane. Forces acting on the mandible and the relationship between muscle pulls and fracture angulation. A: Horizontally unfavorable. B: Horizontally favorable. C: Vertically unfavorable. D: Vertically favorable. For patient education resources, see the Breaks, Fractures, and Dislocations Center, as well as Broken Jaw. The angle of the mandible is the triangular region bounded by the anterior border of the masseter muscle to the posterior and superior attachment of the masseter muscle (usually distal to the third molar). This area may become fractured secondary to vehicular accidents, assaults, falls, sporting accidents, and other miscellaneous causes. The mandible is involved in 70% of patients with facial fractures. The number of mandible fractures per patient ranges from 1.5-1.8. Approximately 50% of patients with a mandible fracture have more than 1 fracture. In a series of 136 patients with angle fractures, 40% had fractures exclusive to the angle, while 60% had multiple fractures that included an angle fracture. The mandible fracture patterns of a suburban trauma center found that violent crimes such as assault and gunshot wounds accounted for most fractures (50%), while motor vehicle accidents were less likely (29%). Vehicular accidents and assaults are the primary causes of mandibular fractures throughout the world. Optimal mandible function requires maintenance of normal anatomic shape and stiffness (ie, resistance to deformation under load). Normal occlusion can be defined when the mesiolabial cusp of the maxillary first molar approximates the buccal groove of the mandibular first molar. Fractures result secondary to mechanical overload. Torque results in spiral fractures; avulsion, in transverse fractures; bending, in short oblique fractures; and compression, in impaction and comminution. Degree of fragmentation depends upon energy transfer as a result of overload. Therefore, wedge and multifragmentary fractures are associated with higher energy release. An evidence-based study involving 3002 patients with mandibular fractures found that the presence of a lower third molar may double the risk of an angle fracture of the mandible. Another study compared fractures with wisdom teeth to those without and found an increased infectious risk (16.6%) in fractures with wisdom teeth compared with 9.5% risk in fractures without wisdom teeth. Obtain a thorough history specific to preexisting systemic bone disease, neoplasia, arthritis, collagen vascular disorders, and temporomandibular joint (TMJ) dysfunction. Knowledge of the type and direction of the causative traumatic force helps determine the nature of injury. For example, motor vehicle accidents (MVAs) have a larger associated magnitude of force than assaults. As a result, a patient who has experienced an MVA most often sustains multiple, compound, comminuted mandibular fractures, whereas a patient hit by a fist may sustain a single, simple, nondisplaced fracture. Knowing the direction of force and the object associated with the fracture also assists the clinician in suspecting and diagnosing additional fractures. Change in occlusion may be evident on physical examination. Any change is highly suggestive of mandibular fracture. Ask the patient to compare postinjury and preinjury occlusion. Posttraumatic premature posterior dental contact (anterior open bite) and retrognathic occlusion may result from a mandibular angle fracture. Unilateral open bite deformity is associated with a unilateral angle fracture. Change in facial contour or loss of external mandibular form may indicate mandibular fracture. An angle fracture may cause the lateral aspect of the face to appear flattened. Loss of the mandibular angle on palpation may be because of an unfavorable angle fracture in which the proximal segment rotates superiorly. The anterior face may be displaced forward, causing elongation. Lacerations, hematoma, and ecchymosis may be associated with mandibular fractures. Their presence should alert the clinician that thorough investigation is necessary to exclude fracture. Do not close facial lacerations before treating underlying fractures except in the case of life-threatening hemorrhage. Pain, swelling, redness, and localized calor are signs of inflammation evident in primary trauma. The angle of the mandible is the triangular region bounded by the anterior border of the masseter muscle to the posterior and superior attachment of the masseter muscle (usually distal to the third molar). Evaluate and monitor the patient's general physical condition prior to treating mandibular fractures. Any force capable of causing a mandibular fracture may also injure other organ systems. Case reports have documented concurrent posttraumatic thrombotic occlusion of the internal carotid artery and basilar skull fractures. Bilateral cervical subcutaneous emphysema, pneumothorax, pneumomediastinum, and spleen lacerations have also been associated with mandible fractures after trauma. Cole P, Rottgers SA, Cameron H, et al. Improving the minimally invasive approach to mandible angle repair. J Craniofac Surg. 2008 Mar. 19(2):525-7. [Medline]. Hsueh WD, Schechter CB, Tien Shaw I, Stupak HD. Comparison of intraoral and extraoral approaches to mandibular angle fracture repair with cost implications. Laryngoscope. 2015 Jul 7. [Medline]. Pattar P, Shetty S, Degala S. A Prospective Study on Management of Mandibular Angle Fracture. J Maxillofac Oral Surg. 2014 Dec. 13 (4):592-8. [Medline]. Ribeiro-Junior PD, Vago TM, da Silva WS, Padovan LEM, Tiossi R. Mandibular angle fractures treated with a single miniplate without postoperative maxillomandibular fixation: A retrospective evaluation of 50 patients. Cranio. 2017 May 29. 1-9. [Medline]. Al-Moraissi EA, Ellis E 3rd. What method for management of unilateral mandibular angle fractures has the lowest rate of postoperative complications? A systematic review and meta-analysis. J Oral Maxillofac Surg. 2014 Nov. 72 (11):2197-211. [Medline]. A transverse fracture of the mandible angle without displacement. A: Transverse fracture of the right mandible with fixation using miniplates at the superior and inferior borders. B: Postoperative radiograph demonstrating fixation. Comminuted angular fracture of the left mandible. A: Transverse and longitudinal fractures. B: A lag screw and reconstruction plate used to provide fixation. C: Radiograph depicting fixation. Comminuted fracture of the ascending mandibular ramus. A: A comminuted fracture of the left ascending ramus. B: Reduction using miniplates of the superior aspect of the ascending ramus. C: Bridging of the comminuted area using a reconstruction plate.